Did President-elect Barack Hussein Obama commit a federal crime in September of this year? Or did he never actually register and, instead, did friends of his in the Chicago federal records center, which maintains the official copy of his alleged Selective Service registration commit the crime for him? It’s either one or the other, as indicated by the release of Barack Obama’s official Selective Service registration for the draft. A friend of mine, who is a retired federal agent, spent almost a year trying to obtain this document through a Freedom of Information Act request, and, after much stonewalling, finally received it and released it to me. But the release of Obama’s draft registration and an accompanying document, posted below, raises more questions than it answers. And it shows many signs of fraud, not to mention putting the lie to Obama’s claim that he registered for the draft in June 1979, before it was required by law. The official campaign for President may be over. But Barack Obama’s Selective Service registration card and accompanying documents show that questions about him are not only NOT over, but if the signature on the document is in fact his, our next Commander-in-Chief may have committed a federal crime in 2008, well within the statute of limitations on the matter. If it is not his, then it’s proof positive that our next Commander-in-Chief never registered with the Selective Service as required by law. By law, he was required to register and was legally able to do so until the age of 26. First, there is the Document Location Number (DLN) on the form. In the upper right hand corner of the Selective Service form SSS Form 1, there is the standard Bates-stamped DLN, in this case “0897080632,” which I’ve labeled as “A” on both the SSS Form and the computer printout document. On the form, it reflects a 2008 creation, but on the printout, an extra eight was added in front of the number to make it look like it is from 1980, when it was actually created in 2008. Having worked for the Federal Government for several decades, I know that the standardization of DLNs have the first two digits of the DLN representing the year of issue. That would mean that this DLN was issued in 2008. The DLN on the computer screen printout is the exact same number, except an 8 has been added to make it look like it is from 1980 and give it a 1980 DLN number. And 1980 is the year Senator/President Elect Obama is said to have timely registered. So, why does the machine-stamped DLN reflect this year (2008) and the DLN in the database (which was manually input) reflect a “corrected” DLN year of 1980? Were all the DLNs issued in 1980 erroneously marked with a 2008 DLN year or does the Selective Service use a different DLN system then the rest of the Federal Government? Or was the SSS Form 1 actually processed in 2008 and not 1980? It’s quite a “coincidence” . . . that is, if you believe in coincidences, especially in this case. Far more likely is that someone made up a fake Selective Service registration to cover Obama’s lack of having done so, and that the person stamping the form forgot (or was unable to) change the year to “80” instead of the current “08”. They either forgot to fake the DLN number or couldn’t do so. When a young man reaches 18 he can go to any of the 35,000 post offices nationwide to register with Selective Service. There he completes a simple registration card and mails it to the Selective Service System. This begins a multi-step process which results in the man’s registration. Each week approximately 6,000 completed registration cards are sent to the Selective Service System’s Data Management System (DMC) near Chicago, Ill. At the DMC these cards are grouped into manageable quantities. Each card is then microfilmed and stamped with a sequential document locator number. The processed microfilm is reviewed to account for all documents and to ensure that the film quality is within strict standards. After microfilming, the cards are keyed and then verified by a different data transcriber. The Document Locator Number (DLN) is an automatic function (Selective Service record-keeping, specifically the DLN is described on pages 7-8 of this Federal Register document), with the first two digits comprising the year, and it was not changed to “08” in error. So if the form was filed and processed in 1980, how did it get a 2008 DLN?! Magnification of the form both physically (with a 10x glass) or with different image software does not reflect a clear cut result of either a “80” or a “90”. But, checking the history of SSS Form 1 (see http://www.reginfo.gov/public/do/PRAViewICR?ref_nbr=198002-3240-001#), it’s apparent that in February 1980, the Selective Service agency withdrew a “Request for a new OMB control number” for SSS Form 1 (see also, here)–meaning the agency canceled its previous request for a new form, and one was never issued in “FEB 1980”. Since under the Paperwork Reduction Act of 1980, Pub. L. No. 96-511, 94 Stat. 2812 (Dec. 11, 1980), codified in part at Subchapter I of Chapter 35 of Title 44 a federal agency can not use a form not approved by OMB (Office of Management and Budget), it’s nearly impossible for Senator/President-Elect Obama’s SSS Form 1 to be dated “Feb 1980.” And since that makes it almost certainly dated “Feb 1990,” then how could Barack Obama sign it and the postal clerk stamp it almost ten (10) years before its issue?! Simply not possible. The lower right hand corner reflects that the Obama SSS form 1 was approved by OMB with an approval number of 19? ?0002, labeled as “C“. The double question marks (??) reflect digits that are not completely clear. Then, there is the question as to whether the Postal Stamp is real. The “postmark” stamp–labeled “E“–is hard to read, but it is clear that at the bottom is “USPO” which stands typically for United States Post Office. However, current “postmark” validator, registry, or round dater stamps (item 570 per the Postal Operations Manual) shows “USPS” for United States Postal Service. The change from Post Office to Postal Service occurred on August 12, 1970, when President Nixon signed into law the most comprehensive postal legislation since the founding of the Republic–Public Law 91-375. The new Postal Service officially began operations on July 1, 1971. Why was an old, obsolete postmark round dater stamp used almost ten (10) years after the fact to validate a legal document . 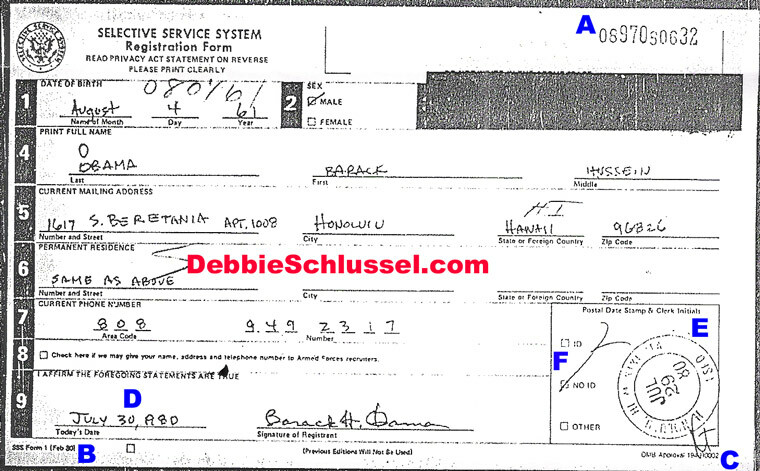 . . that just happened to be Barack Obama’s suspicious Selective Service registration form? The SSS Form 1 states “NO ID”, labeled “F“. Since that’s the case, then how did the Hawaiian postal clerk know that the submitter was really Barack H. Obama, who may have been on summer break from attending Occidental College in California. How would they determine whether the registrant was truly registering and not a relative, friend, or other imposter? * The Selective Service Data Mgt. Center Stonewalled for Almost a Year on Obama Registration, Until Right Before the Election. Sir: There may be an error in his file or many other reasons why his registration cannot be confirmed on-line. However, I did confirm with our Data Management Center that he is, indeed, registered with the Selective Service System, in compliance with Federal law. 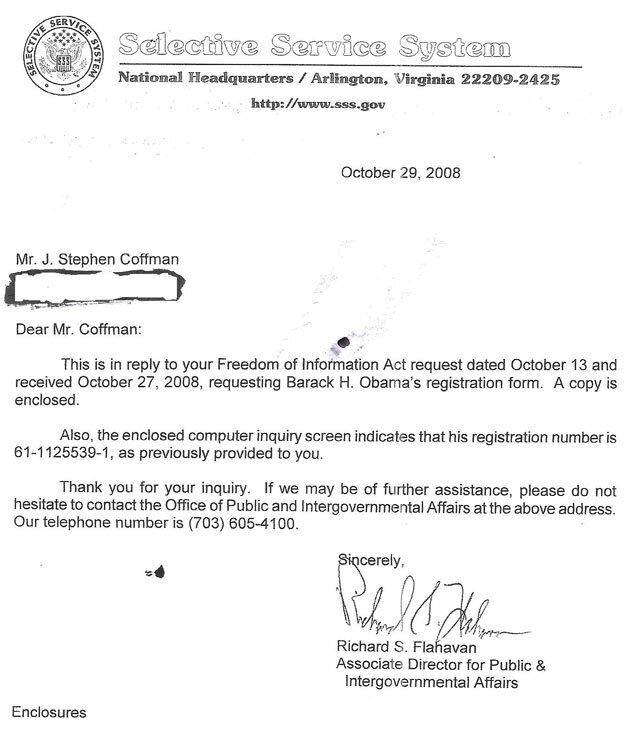 Then, they suddenly found the record on September 9, 2008 (prior to my October 13, 2008 request), and stated that his record was filed on September 4, 1980. Did they temporarily change the date on the computer database? On the previous FOIA response, they stated that it was filed on September 4, 1980. In my second request I mentioned that Obama could not have filed it in Hawaii on September 4, 1980 as he was attending Occidental College in California, the classes of which commenced August 24, 1980. Where is Obama’s Selective Service number (61-1125539-1) on the card? The last transaction date is 09/04/80 [DS: labeled “G“], but the date of the printout is 09/09/08 [DS: labeled “H“]. My FOIA was dated October 13 so why did they prepare the printout BEFORE I submitted my FOIA? I gave them no “heads up” that I was sending it. In fact it was not mailed until late October–around the 25th. Also, notice the printout was page 1 of 2 [DS: labeled “I“]. Hmmm . . . where is the other page, and what’s on it? A lot of questions here. 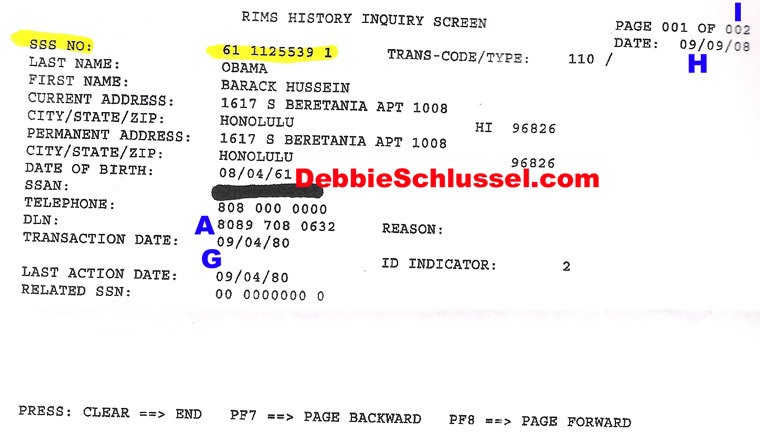 And a lot of huge hints that this government-released, official Barack Obama Selective Service registration was faked. Either he signed the fake backdated document, or someone else faked his signature and he never registered for the draft (and lied about it). It’s incredible that our impending Commander-in-Chief either didn’t register for the draft or did so belatedly and fraudulently. The documents indicate it’s one or the other. My husband printed the information provided on your web site regarding Barack Obama’s Selective Service registration discrepancies. I noticed that the DLN number in upper right corner (labeled “A“) has only ten (10) digits with the first two being 08 , but the DLN number shown on the computer screen printout has eleven (11) digits with the first two being 80. It clearly indicates that the “8” was added at the beginning of the DLN number, in order to appear that it was issued in 1980 and wasn’t simply a reversal of the first two digits as the retired federal agent noted. This in itself appears questionable. I would think there is a standard number of digits in all DLN numbers. The recently retired federal agent has requested that I disclose his identity so that there is no question as to the source of the information. His name is Stephen Coffman. He retired last year from the position of the Resident Agent in Charge of Immigration and Customs Enforcement’s (ICE) Galveston, Texas office. He has over 32 years of government service and has held a Secret or higher security clearance for the majority of those years. He filed the FOIA with Selective Service and has the original letter and the attachments. He first notified the Selective Service of his findings and they ignored the questions. He can be reached via email at retirediceagent@sbcglobal.net. I notice the SS# is redacted. I wonder if Obama was using a legitimate number (if he ever even had one) or had switched over to someone else’s SS#?